For busy parents and caregivers, baby food pouches can be a lifesaver: They seem fairly healthy, they’re simple to grab if you’re on the go, and they’re easy for little ones to eat. But are they actually healthy and beneficial to kids? 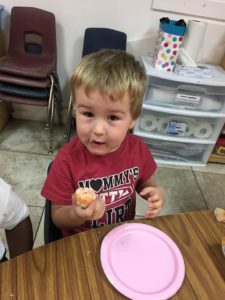 There’s so much (sometimes conflicting) information out there when it comes to raising young children: and when it comes to food, it seems as if there’s a new story every day about solids, when to introduce them, allergens, etc. Lately, it’s baby food pouches that have been scrutinized, especially following a recent report in The New York Times. 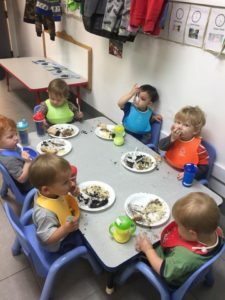 The article cites experts who said that babies and toddlers who use the pouches too much can miss out on the developmental skills they need, that will contribute to healthy eating habits down the road. In case you’re wondering what exactly a “pouch” consists of, it’s mostly pureed fruits and vegetables. Sometimes a starch, such as quinoa, will be included. There are seemingly a million flavor combinations and the ingredients are often organic. Also, most of the pouches don’t contain any added sugar, so they seem like an ideal option for those who are trying to keep health and convenience top of mind. They were introduced about 10 years ago, according to the Times. Scroll down for some ideas on the best ways you can feed your toddlers and babies. Above all else, the appeal seems to be in the parents’ ability to toss the pouch into a backpack or purse. It won’t go bad in the sun, it doesn’t have to be refrigerated and it’s pretty easy to hand over to a hungry baby or toddler. But too many pouches can lead to bad habits when it comes to snacking and routine overeating, experts say. Also, when they’re given to babies who are just figuring out how to eat — learning skills such as chewing, swallowing; expanding their palates, taking in the multisensory experience — experts believe the pouches fail to challenge these children at this stage of their development. “Kids need the taste of what the actual food is, to come to like it later,” Dr. Natalie Muth, a pediatrician and spokeswoman for the American Academy of Pediatrics, said to the Times. Many sweet fruits, such as pears, make up the base of the foods in these pouches. The idea is that babies and toddlers won’t learn to like, or tolerate, spinach, if it’s masked by a sweet-tasting food. Tossing your toddler a pouch when he’s crabby also associates this sweet treat with calming down — and that’s not great, as a general habit. You want your kids to become mindful eaters who eat when they are hungry and stop when they’re full. Giving pouches as rewards, or to calm down a tantrum, for example, feeds the child when she’s not necessarily hungry, which is another not-ideal practice. The conclusion? On their own, the pouches aren’t terrible. But it seems to be parents’ reliance on them that becomes a problem. Offering several pouches a day isn’t great. Experts suggest if you have to give a pouch, see if you can dump the contents into a bowl or serve it with a spoon. Your kids need to learn how to eat, not just drink — they know how to drink from the moment they’re born. For babies and toddlers, eating should be educational and nutritious, experts say. What they eat at this phase of their lives sets the stage for what they’ll eat later, and how willing they’ll be to try new foods and textures. They shouldn’t be a regular substitute for fresh food. Don’t let pouches replace finger foods: meat, eggs, beans, etc. You want to make meals and snacks a sit-down occasion whenever possible. A pouch here or there? No problem. But you might want to think twice before making them a habit. With experts cautioning against the use of too many pouches, here are some ideas on the best ways you can feed your toddlers and babies. 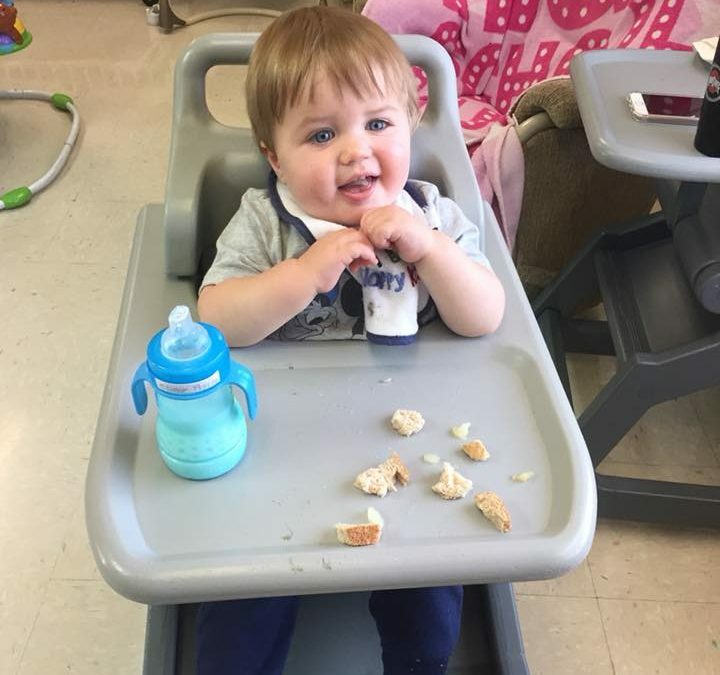 Depending on age (of course), let your little one self-feed — even if he isn’t great at it, at first. This is a learned skill. She’ll get better eventually! Practice makes perfect. Just make sure you’re offering appropriate sized bites, and foods that are soft enough for younger babies to manage. Keep offering foods, regardless of how much your child seems to like them. This is how you develop a well-rounded eater. Keep in mind, it might take as many as 10 times for your son or daughter to “like” something. Don’t let that discourage you! Offer utensils whenever possible. Again, this is a learned skill that pays off down the road. Also offer foods that encourage chewing (which pouches don’t). Create a meal/snack routine. Only offer pouches when you’re truly in a bind, or unable to get to a table. Again, it’s not that the pouches themselves are the worst things ever — they’re often better than offering your child cookies or chips. The ingredients are often reasonable enough. It’s just that you don’t want to crutch on these, in lieu of offering real, fresh foods in their true forms. Quick and easy snack ideas: String cheese, pretzel rods, fruit or vegetables soft-boiled and cut to an appropriate size. Get in the habit: Of only feeding your children when they’re hungry, and not crutching on these quick-fix pouches to solve a crabby mood. Try things: Don’t assume you have a picky eater on your hands and move straight to the pouches. You call the shots around here. Thinking you want to solve a quick problem and hand over a pouch? Think again — a little work will go a long way, according to the experts.